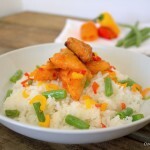 Tofu is something that can be very scary or extremely delicious! 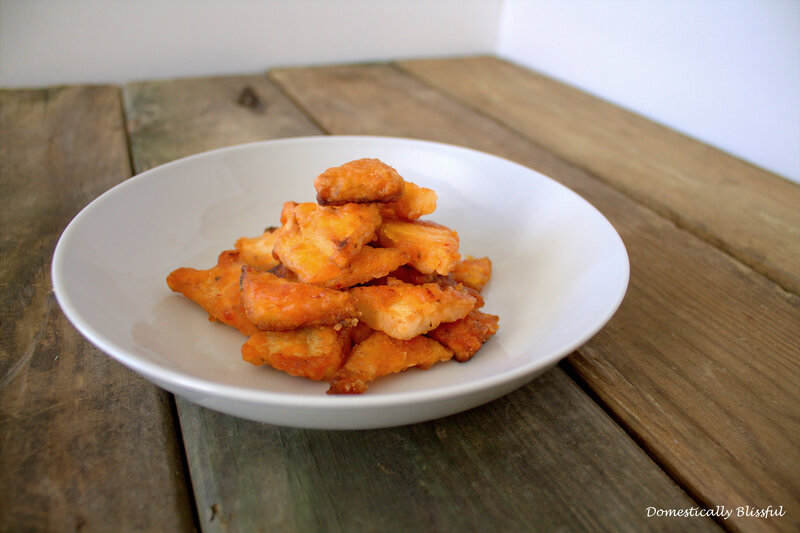 This Crispy Asian Tofu is similar to the Crispy Tofu that I made for you last year, but instead of crisping the actual tofu this Crispy Asian Tofu has a crispy crust! 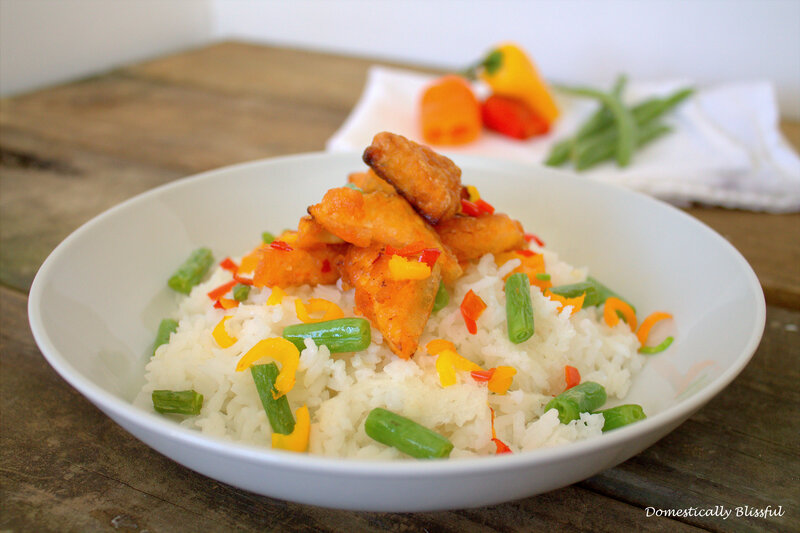 My husband and I love making this Crispy Asian Tofu and experimenting with different dishes to incorporate it into, like stir fry, curry, or this Sweet and Sour Tofu – I even eat it hot out of the pan sometimes! The secret to this Crispy Asian Tofu is the cornstarch! Crazy right? First, turn the tofu on its side and slice the tofu into five sections. Turn the tofu back over and use the knife to cut a “X”, then make another two slices to make a “t”. 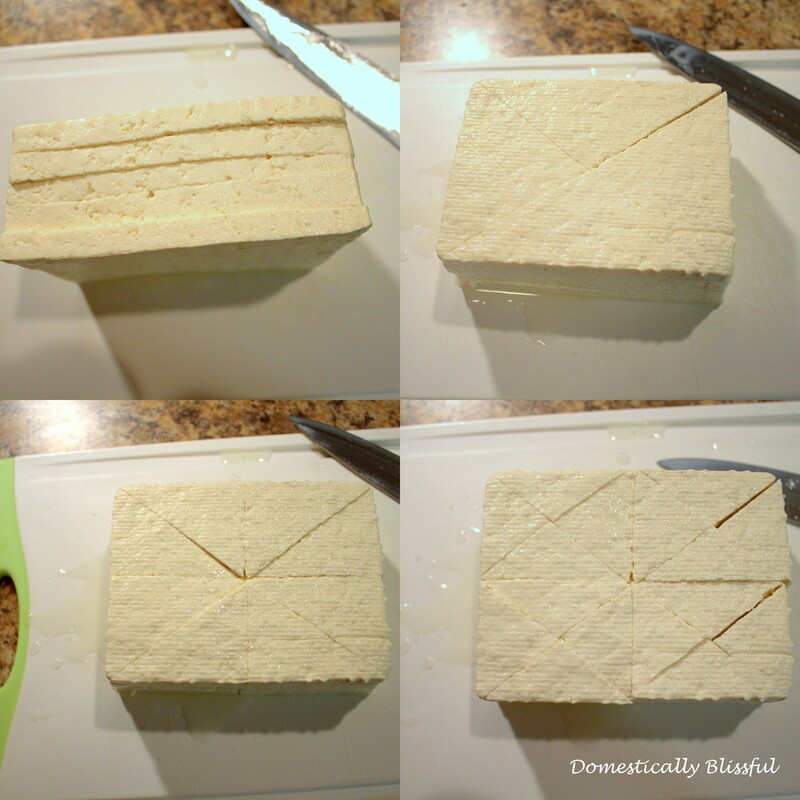 You could leave it at this step and have large triangular tofu or you can cut them into smaller triangular like the above picture. Next, place the tofu in a clean hand towel, wrap it up, and gently squeeze so that some of the liquid is released from the tofu. If the towel is really wet place the tofu in a new towel, wrap it up, and set it to the side. In a medium sized bowl whisk together 1 tablespoon chili paste, ¼ cup sweet and sour sauce, 1 teaspoon rice wine vinegar, and 2 teaspoons soy sauce. 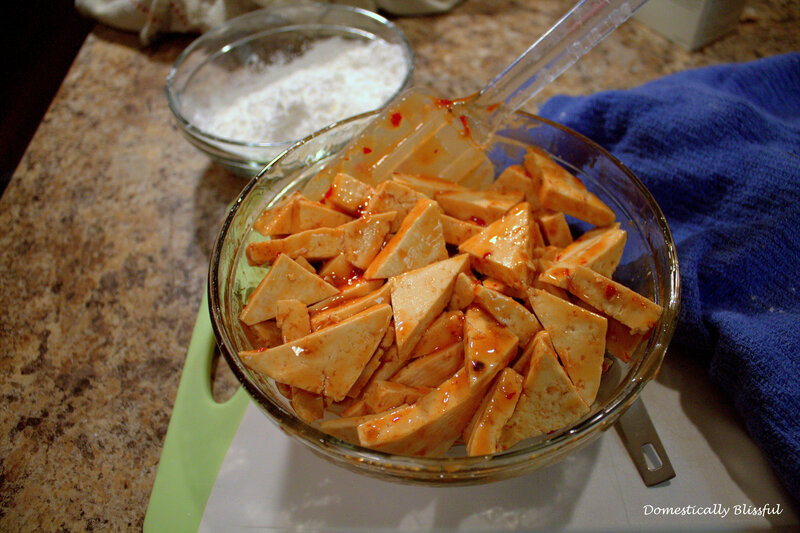 Remove the tofu from the towel and fold the tofu into the sauce gently until all of the tofu is coated. 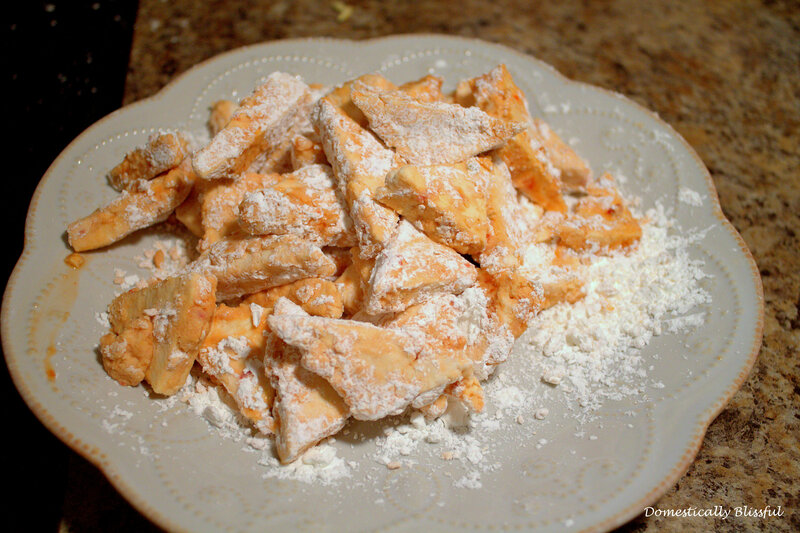 In a small bowl pour ½ cup of cornstarch, place a few of the tofu into the cornstarch, then into a sifter to shake out any extra cornstarch, then place them onto a plate. Continue to do this until all of the tofu has been coated – feel free to add more cornstarch to the bowl as needed. Place a large pan on the stove and pour in enough vegetable oil to coat the majority of the pan, about ¼ cup, and turn the heat to medium. Once the oil begins to simmer turn the heat down to medium low and place the tofu in the pan – there’s a lot of tofu and not a lot of pan so you might have to cook the tofu in several batches. 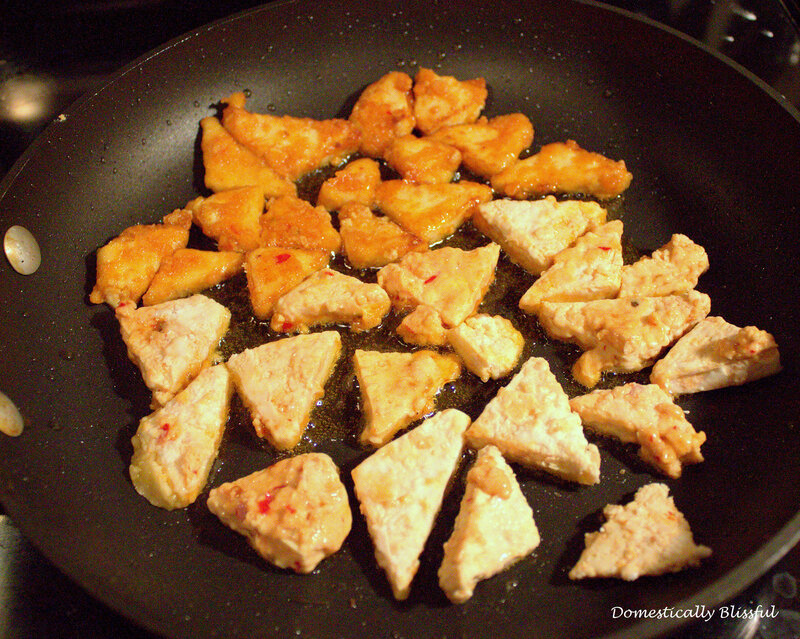 Cook the tofu until both sides are golden brown and crispy. I usually turn the oven to 350° and place the cooked tofu on a baking sheet lined with foil to keep it warm while the rest of the tofu is cooking. 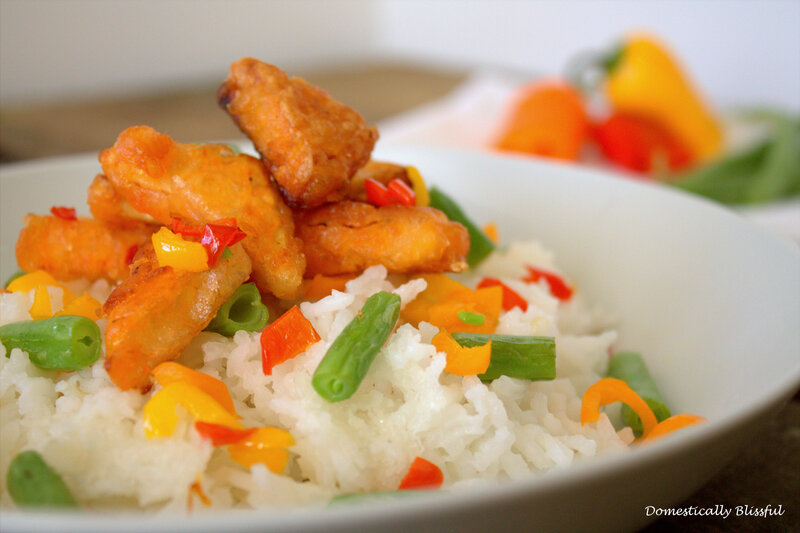 Serve warm over rice with vegetables and your favorite Asian sauce or turn it into this Sweet and Sour Tofu. 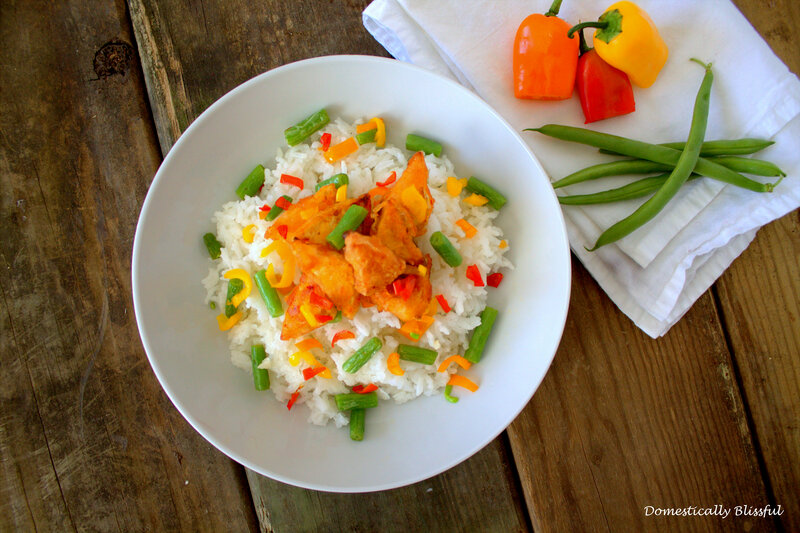 Serve warm over rice with vegetables and your favorite Asian sauce or turn it into Sweet and Sour Tofu.